HomeSpearfishing TipsSpearfishing | Where to find fish? The ocean is a large place, some parts of it are havens of marine life and others can be like barren deserts. In this guide, we will give you some tips to find your oasis in the ocean. 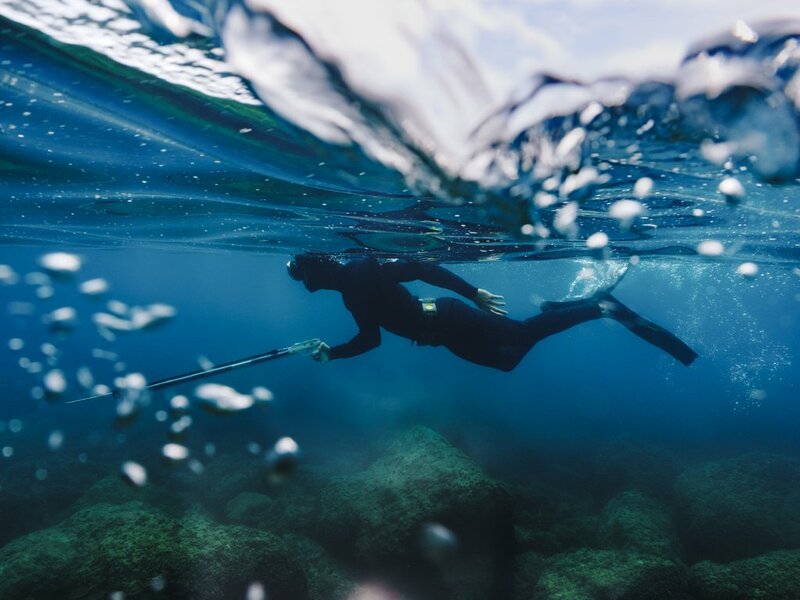 Whether you are spearfishing or just exploring, it often requires the ability to seek out fish in locations you may have never seen or heard of before. Each location and fish species are unique but there are some familiar features that you can look out for to help you find and think like a fish. Ocean current is the highway that disperses nutrients to fish. In general, areas where there is some current running it will increase your chances of finding and spearing fish. Go to the up-current side of an obstacle such as a reef, small island or man made structure such as an oil rig. The reason for this is the current hits the front of the obstacle and creates an upwelling of nutrients. This attracts small baitfish and these then attract the larger fish you are hunting. Another place to find fish is where there is current running between two obstacles such as reefs or bodies of land. This creates a passage of strong current and can attract large numbers of fish. Next time you are out spearfishing, take a look at the way the current flows and please remember to have someone in a boat to pick you up if the current is very strong. This sounds obvious, but where there are fish there are fish. For example, where you see schools of any particular species on the surface or under the water using a sounder it is likely there will be more fish in this area. These could be schools of baitfish or anything in particular even if they are not a carnivorous fish or a fish that is hunted by pelagic fish. If you see a school of fish from the surface, drive the boat up to it on the up current side approximately 30m away so you don’t spook the whole school of fish. Jump in the water immediately and allow yourself to drift towards the school. Breath up and dive down next to the school and swim under it to see what’s there rather than diving straight down through the school and breaking them up. In New Zealand we often use this technique to hunt Kingfish when we see schools of fish such as Kahawai (Salmon – Australia) or Trevelli. This idea of spearfishing where the fish are also applies when spearfishing from the shore. When you find areas with many fish not including your targeted species take your time to thoroughly hunt the area or even apply some burley to attract the fish you are after. Birds are generally the first indicator of fish activity you will see from a distance. Gulls, Gannets etc circling and diving into the water is a great sign there are fish down below. Usually, it will start with a handful of birds and it may gain momentum to turn into a full blown feeding frenzy or it may fizzle out and disappear before you get in the water. Reefs or structures in the ocean that are the only distinct feature in the surrounding area can contain large numbers of fish. These areas are often like sanctuaries, providing shelter and a food source for many fish species. Examples include reefs that are the only reef along a sandy coast, a pinnacle rising out of deep water or a rocky point along an otherwise featureless rocky coast. This can also include man made objects such as shipwrecks, flotsam or wharfs. Drop offs into deep water can attract fish due to the upwelling of current and the sanctuary of cracks and crevices the drop off has down its walls. Techniques used here can be diving down to the drop off/ ledge and looking over or diving just off the drop off in open water searching for pelagic fish. The area where the reef and weed meet the sand is a good area to spear fish as it can attract a large variety of fish. This can be kelp forests or low lying seaweeds. In New Zealand a common technique is to find a weedline in water from 10m – 30m with some current running and dive along the weedline. Look out for areas where baitfish are congregating around the weedline. Often the type of fish that feed in these areas will stir up sand when feeding so you can try flicking some sand around to draw fish in from out of range. Keep these things in mind next time you are out looking for a place to freedive or spearfish and whatever you are doing, enjoy the hunt, try new places and get in the water anywhere it is safe to do so. No matter what the conditions or the amount of fish you see, you will learn something from every dive.